Whatever household features you need to refresh, repair, or replace this season, one company can help you get the job done efficiently and affordably! Spring brings blooming flowers and budding trees, but it also brings a long list of home improvement chores that accumulated over the winter. Now is the time to tackle cleaning projects, exterior maintenance, and routine HVAC checkups in preparation for the sweltering months ahead. But with so much to do, it can be hard to decide which tasks are essential and which can wait. Most homeowners will admit that they’re short on the time (and manpower) required to complete all that must be done. So what do you do with a to-do list that never ends? Take a cue from Sears Home Services. With the help of their tips and expert advice, you might just gain the tools you need to chart a road map for your spring home improvement journey. So, get reading, then get to work on giving your home the TLC it deserves. Don’t consider your spring cleaning done and dusted until you have attended to hardworking surfaces and fixtures both indoors and out. Deep cleaning the oft-neglected—but vital—elements of your home like window sashes, exterior siding, and bathroom fixtures not only preserves, but also prolongs the life of these features. – Wash windows: Giving windows a thorough cleaning requires more than polishing the panes. Inspect your windowsills, jambs, and sashes once a year for rot and mold, and replace the windows or casings as necessary. If your windows have seen better days, consider replacement windows, which can really boost curb appeal. As well, new window insulation technology affords more comfortable indoor temperatures, keeping warm air out in the summer and inside during the winter. And remember that even newer windows have to be maintained, and this task takes conscientious effort. To save time and elbow grease, consider purchasing no- or low-maintenance windows. Moisture-resistant vinyl windows, such as Sears’ Weatherbeater windows, are a good bet. Because the frame is made of vinyl instead of wood, there’s no need for paint and the frame is not prone to rot. Plus, easy-to-access tilt-in sashes make cleaning the exterior panes a breeze. – Hose down exterior siding: A fresh-faced house begins with clean siding. No matter what kind of siding you have—wood, brick, or vinyl—you can start by giving your home exterior a quick hose-down. To banish destructive mold, mildew, and discoloration, however, you may need to employ an effective cleanser and a bit of elbow grease. For wood siding, use mild soap and water, then scrub with a gentle brush to remove spots and stains. If your home has brick siding, try a mixture of bleach and water to eliminate mold or mildew. And if you’re looking for the lowest-maintenance siding material, consider vinyl. As Jim Eldredge of Sears Home Services points out, “more often than not, cleaning vinyl means nothing more than rinsing with a garden hose.” No matter what kind of siding you have, make sure you put a good cleaning toward the top of your springtime to-do list. Sparkling siding boosts curb appeal and keeps your admiring neighbors happy. – Give faucets and sinks a facelift: Over recent years, numerous sink and faucet design trends have emerged, including deep basin sinks and faucets with detachable sprayers. But one trend has never been in vogue—mold and mildew-lined faucets and sinks. If your kitchen or bathroom sinks are less than fresh, clean them with a non-damaging solution like vinegar, lemons, or mild detergent. While a good cleaning can solve many sink problems, some issues—such as chipped enamel or stubborn rust stains—might call for a full replacement. If you’re not sure where to start with your mini remodel, consider calling Sears Home Services for a free consultation. If Old Man Winter pummeled your home with snowstorms, deep freezes, and fallen trees last season, it may now have the damaged roof, gutters, doors, and walkways to prove it. Inspect exterior features for damage or deformity, replacing or refreshing them so they can continue doing the work they were designed to do, protecting your home from wind, rain, and other dangers. – Check the roof and gutters: If, during your spring roof inspection, you observe broken, buckling, or missing shingles, you should either repair or replace the damaged sections to keep water and pests from entering your home. Likewise, replace cracked or sagging gutters so that water channels away from the foundation, where it can lead to flooded basements or worse. To get a start on your roof or gutter repair, why not contact the project consultants at Sears Home Services? Their trusted team of experts can walk you through every contractor bid and proposal to help you secure quality materials and installation, all within your budget. 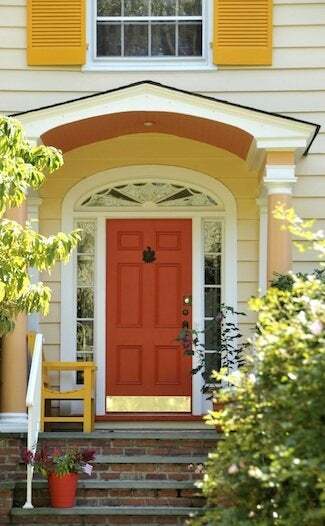 – Update the front door, or more: A weatherworn entry door that bears no other signs of distress, such as cracks, dents, or a sagging frame, may just need a fresh coat of paint. In fact, paint can be a great solution for a tired exterior. 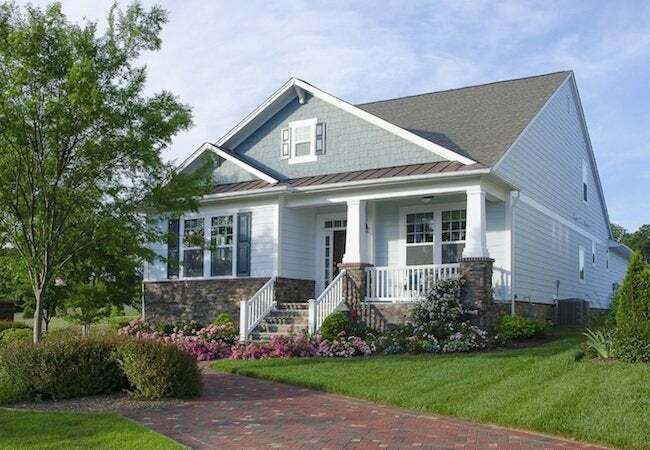 “Painting the exterior gives your home an all-new look, and it’s a great option for those on a tighter budget,” says Eldredge. If your whole house could benefit from an updated paint job, begin by choosing a paint color and prepping the exterior surfaces. Hose off dirt, scrape flaking paint, and caulk cracks and gaps before you get started to make your new paint job last longer. If you decide to have the work completed by a pro, consider calling the paint experts at Sears Home Services. Their rigorous 10-step approach to painting prep is designed to produce a clean canvas for a fresh color that you can love for years. – Replace chipped walkways or patios: Winter weather is hard on concrete walkways and patios. Fluctuations in temperature—repeated freezing and thawing—can cause these hard surfaces to crack and chip. Spring is the perfect time to repair this damage. First, purchase a concrete repair mix from your local home center. Once you’ve gathered the necessary tools and materials, use a chisel and hammer to chip away loose pieces of concrete, then rinse the area before applying the repair compound with a putty knife. Pick a rain-free weekend for the fix to allow the patch enough time to set. Soaring temperatures will be here before you know it, and by then it will be too late to perform preventive maintenance on your HVAC system. Now is the time to inspect your HVAC units and prepare them to handle the blistering summer. So, eyeball your air conditioner, attic fan, and ductwork for signs of trouble, replacing them if needed to ensure that fresh, cool air circulates throughout your home no matter how hot it gets outside. – Inspect the air conditioner: Power on your AC unit to make sure it’s still providing clean, cool air to your home. If yours isn’t quite cutting it anymore—if you have to endure poor indoor air quality, excessive noise, or uneven cooling—it’s time to consider repairing or replacing it. Before you opt for a repair, take the unit’s age into account; repairing an older model may not be worth it. According to David Kenyon of Sears Home Services, an AC unit older than a decade “may already be on borrowed time.” If you’re not sure whether you’d be better off repairing or replacing, consider scheduling a free in-home consultation with the experts at Sears Home Services. Their project coordinators may be able to help you evaluate the situation and select a course of action that will result in peace of mind and a cool, comfortable home. – Test the attic fan: An attic fan keeps your home cool and your energy bills low. The downside of a whole-house fan, however, is that the fan motor frequently burns out. Test your attic fan motor by switching it on. Replace it if it won’t run—most new motors cost between $50 and $100 and take little effort to replace. If you have an older model, though, consider the benefits of replacing the whole fan rather than just the motor. Newer fans boast greater energy efficiency, resulting in lower utility bills, so “it may actually be more cost-effective to upgrade,” says Kenyon, than to repair an old unit. – Check ductwork for efficiency: Ducts that channel air from the HVAC system to your home’s interior spaces are “notorious for collecting and distributing irritants and allergens,” says Kenyon. These airborne annoyances can then make their way into the home, causing poor indoor air quality. While you can easily clean your system’s grilles and return registers to remove accumulated dust and grime, experts like those at Sears Home Services are better equipped to perform a comprehensive duct cleanup. Using truck-mounted suction equipment and other specialized tools, they can restore good air quality—and let you get back to more enjoyable spring activities.